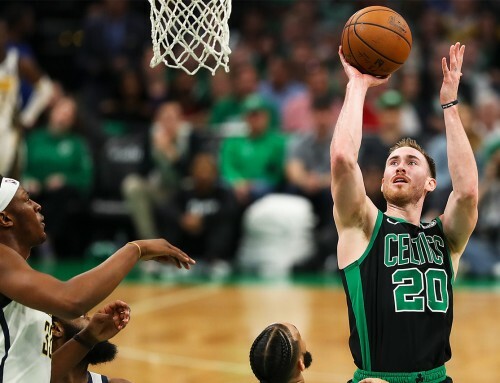 Gordon Hayward’s Utah Jazz entered the All-Star break at an even 26-26, but the road to reach .500 has been anything but a smooth ride. Throughout much of the first half of the season, the Jazz were plagued by injuries to key contributors, such as Derrick Favors, Rudy Gobert and a host of others. One of the few constants was Gordon, who has followed up last year’s career-best season with another career year thus far. He has played and started all 52 games and is sixth in the league with 1,877 minutes played. He has been a do-all wing presence for the Jazz, leading his team in scoring at 19.9 points and in assists at 3.7 dimes per game. He’s also fourth in rebounding at 5.1 and second in steals at 1.13 per contest. 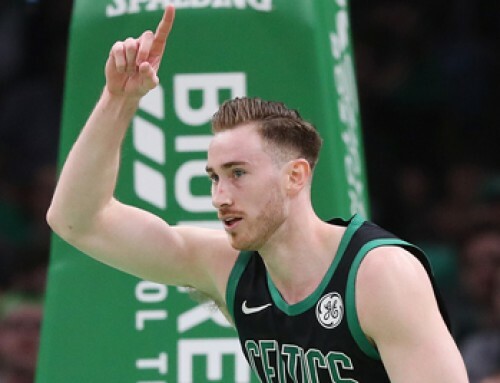 Although his team struggled to win close games early in the season, Gordon has led the charge to close out games late in the fourth quarter and in overtime, particularly of late. The Jazz started out strong at 3-2, but lost three straight games to Eastern Conference opponents to fall to 3-5. Utah picked up two wins against the Toronto Raptors and Atlanta Hawks to move back to 5-5, and then hovered around .500 for most of the remainder of the first half of the season. A highlight came after a lopsided loss to the Oklahoma City Thunder that dropped the Jazz to 6-7 going into Thanksgiving break—the one-month benchmark for the NBA season. H20 responded with a 33-point night to top the Los Angeles Clippers and spark a two-game win streak. G-Time and Co. halted Paul George and the Indiana Pacers head-to-head and beat the Knicks soon after, but another matchup with the Thunder tripped the Jazz up once again. Gordon totaled 41 points and 12 rebounds, but the Jazz fell 94-90 and 104-98. However those meetings came with the team’s promising young rim protector, Rudy Gobert, out of commission with a knee injury. Then about two weeks later, the injury bug bit Utah once again. Derrick Favors missed Utah’s Dec. 26 meeting with the Los Angeles Clippers due to back spasms and didn’t return until Jan. 25. One game later, Alec Burks joined them on the shelf. The scoring guard was expected to carry a bigger scoring load with Gobert and Favors out—not to mention the absence of starting point guard Dante Exum, who is out for the season with an ACL injury sustained in the offseason. But he broke his leg in that Dec. 26 meeting with L.A., leaving the Jazz even more shorthanded. With his team in need, Gordon stepped up. He scored 34 and 25 in consecutive wins over the Miami Heat and Los Angeles Lakers—but then came performances of 36 and 27 in back-to-back overtime defeats to the Charlotte Hornets and New York Knicks. The Jazz just didn’t have the depth to win consistently, particularly in late-game situations. But help soon arrived. Gobert returned on Jan. 7 and worked his way back to full form, and Favors rejoined the party as well. Just nine days after Utah suffered a double-overtime defeat to Charlotte, the Jazz made a statement, dismantling the Hornets 102-73. A few nights later, G-Time showed once again just how dangerous a healthy Utah team can be. Utah and the Chicago Bulls battled all the way into extra time, but Gordon came through with the first in a string over clutch performances. He accounted for 10 of his team’s 12 points in overtime as the Jazz finished forcefully in a 105-96 victory. H20 was happy to help his team to its first three-game win streak of the season. The Jazz just kept rolling from there. They regained their dominant defensive form to shut down the Denver Nuggets. No. 20 had 14 second-half points to fuel a late surge in the 85-81 win. That weekend Utah topped the Milwaukee Bucks, 84-81, and the Phoenix Suns, 98-89, to push the streak to six. G-Time totaled 40 points in the two victories. The Jazz had won six in a row and only two games separated them from the break: a road back-to-back against a pair of Western Conference competitors, the Dallas Mavericks and New Orleans Pelicans. In Dallas, Gordon stepped up in the biggest moment of a thriller. With four seconds left in overtime, he curled around the Dallas defense and sank a lethal step-back jumper from the baseline to give the Jazz a 121-119 win at the buzzer. Unfortunately, the streak ceased and seven for Utah. The Jazz saw a 21-point game in 40 minutes from No. 20 and a 29-point night by Favors but came up just short in a 100-96 defeat. The tired Jazz couldn’t quite win magic No. 8, but they still came away with even more confidence heading into the break. 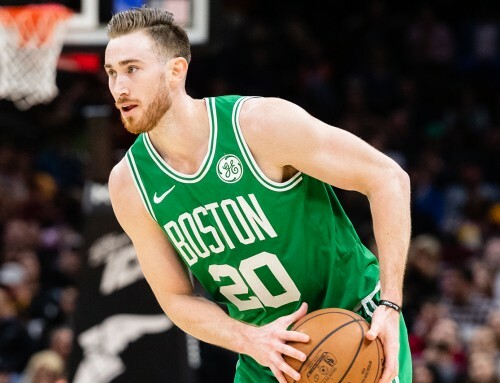 0 – The injury bug hit the Jazz hard, but Gordon has enjoyed a clean bill of health this season, missing zero games and starting and playing in all 52. 1 – There has only been one game this season where Gordon shot less than 50 percent from the free throw line. 5.1 – Gordon is averaging 5.1 rebounds per game, a mark he’s only hit once before in his six-year career. 6 – During a six-game span of games in late January, G-time did not miss a free throw. He made all of his 29 free throw attempts. 19.9 – G-Time is having another career-best season, averaging 19.9 points per game. 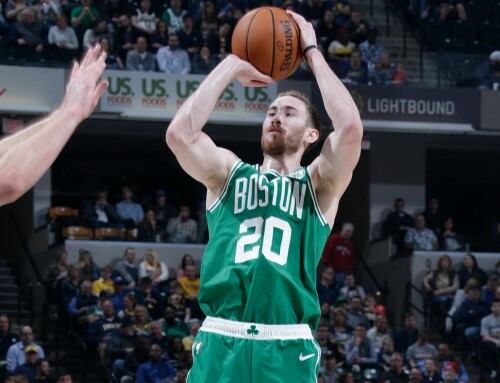 20.7 – In the month of February, Gordon is averaging 20.7 points a game. 28 – Gordon has scored 20 or more points 28 times this season, in more than half of the games the Jazz have played. He’s on pace for the most 20-point games of his career. 36 – On Jan. 18, H20 scored a season-high 36 points in a losing effort to the Charlotte Hornets. Gordon made a season-high six 3-pointers in that game. 36.1 – Gordon is averaging 36.1 minutes on the floor this season, nearly two minutes more than he averaged last season. 45 – The most minutes G-time has played in a game this season is 45, which came just two games ago at the Dallas Mavericks. Gordon had never won in his career in Dallas, and he made sure he had the final say, with a buzzer beater that gave his team a victory. On the first day of February, the Jazz were up against the Chicago Bulls at home and still searching for their first three-game win streak of the season. Gordon not only made the shots he needed to in the fourth quarter, but he also dominated overtime to give the Jazz a 105-96 victory. G-Time posted his third double-double of the season with 27 points and 12 rebounds. He also added seven assists. After the Bulls had led most of the game, point guard Derrick Rose knocked down a three-pointer for Chicago with 18.5 seconds left in the game for what he thought was the dagger to take a 93-90 lead. Gordon had other plans. H20 made the front end of a one-and-one on the next Jazz possession, and Derrick Favors and Chris Johnson teamed up to earn Utah a tough hustle rebound. On the inbound, the Jazz went to Gordon, who made a layup through contact over the outstretched arm of Pau Gasol with 8.5 seconds remaining to tie the game at 93. Gordon kept the hustle defense going, as he tipped an inbound pass, which deflected off of Jimmy Butler and into Utah’s possession. Unfortunately, G-Time missed a tough game-winning shot at the end of the fourth quarter, but he didn’t miss much in overtime. He opened up the extra session with an assist on a one-handed bounce pass to Favors. At 3:34 in the overtime period, H20 made Butler jump on a shot fake, which set him up for an easy eight-foot jump shot to give the Jazz a 97-95 lead. Gordon scored again on a 16-foot jump shot with 2:13 on the clock to put the Jazz in front 100-95. H20 then finished the Bulls off with an emphatic dunk off a bounce pass from Joe Ingles. G-time made two free throws late in overtime to make sure the Bulls had no chance of sending the game to a second overtime, as the Jazz got their first third consecutive win of the season. For Gordon and the Jazz, the win not only provided them assurance that they could defeat a playoff-caliber team in overtime. It also gave the Jazz a spark of momentum, as Utah won its next four games. If the season ended today, the Utah Jazz would be in the playoffs as an eight seed in the Western Conference. However, the season is still far from over, and the Jazz have work to do if they want to secure their position in the playoff picture and potentially get a higher seed once the playoffs come. The Jazz sit at 26-26, behind the Portland Trail Blazers (27-27), who would be the No. 7 seed if the season ended today, and ahead of the Houston Rockets (27-28), who are currently just outside the playoff picture. While Utah still has yet to beat the powerhouse teams of the Western Conference in the Golden State Warriors (48-4), the San Antonio Spurs (45-8) and the Oklahoma City Thunder (40-14), the Jazz have beaten every other Western Conference team that sits above them in the playoff picture. This includes the Los Angeles Clippers (35-18), the Memphis Grizzlies (31-22), the Dallas Mavericks (29-16) and the Trail Blazers. The Jazz are also coming out of the break having won seven of their last eight and eight of their last 10. “We’ve been playing good basketball, so the key is to figure out how to keep it going,” Gordon said. The road doesn’t get easier in the second half. 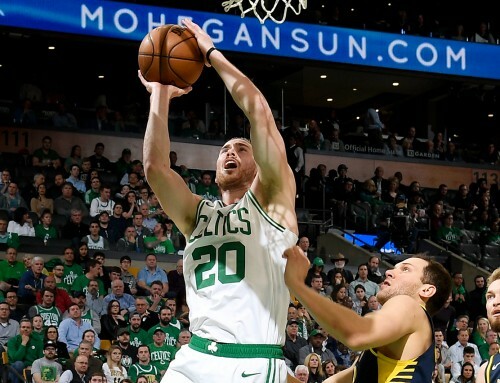 The Jazz start the second half with two consecutive games against Eastern Conference playoff contenders in the Washington Wizards and the Boston Celtics—the latter game a national broadcast on ESPN. Then the Jazz have a three-game stretch against Western Conference playoff contenders: the Trail Blazers, Rockets and Spurs. The Jazz still have two more cracks at Stephen Curry and the Warriors before the end of the regular season, along with a home game against LeBron James the Eastern Conference-leading Cleveland Cavaliers, a road trip against Kevin Durant, Russell Westbrook and Oklahoma City, and a home game against Kawhi Leonard and the Spurs once more in April. There are plenty of challenging opponents throughout the second half of the season, but if the Jazz can pick up where they left off before the All-Star break, which culminated in the Jazz winning seven of their last eight games, they should be able to weather the storm and compete for a Western Conference playoff spot.